This training helps you quickly ramp up on the fundamentals of Altium Designer. In this training, you will create components using the symbol and footprint libraries, and use these components in both a schematic design and PCB layout. The PCB layout instruction includes: preliminary groundwork necessary such as layer stack up and rules; placement of footprints; and routing of connections. You will also get hands-on practice generating manufacturing files from schematics (BOM) and PCB (Gerber and drill files). You will progress through a standard project flow, modifying an existing design to include additional circuitry. The example project used in this course is available from the same example projects folder included with the Altium Designer installation. You will add a new schematic to an existing project, and then pass along those components to the PCB to be placed and routed. After we ensure our PCB adheres to all our design rules, the PCB manufacturing output files can be created. All of the major subordinate tasks along the way will be examined, as well. 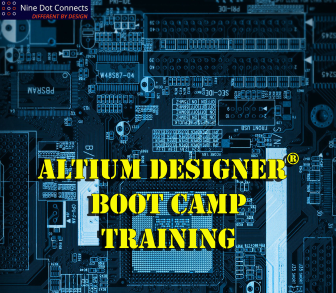 At the conclusion of the course, you should be well acquainted with all of the steps necessary to successfully implement Altium Designer into their PCB production workflow. You will be provided with a training manual (342-pages).